Agony for the Clyde defence as Tam OBriens header finds the net for Forfars winner at Broadwood. Clyde boss Barry Ferguson is refusing to be too downbeat despite his side falling eight points behind Forfar in the League Two title race. 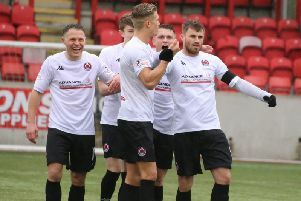 Victory for the Bully Wee in Saturday’s showdown at Broadwood would have ended Forfar’s 100 per cent record and closed the gap between the sides to just two points. But despite Clyde dominating for long spells they couldn’t find a way through and it was Garry Bollan’s side who grabbed the win. Ferguson’s side must now pick themselves up for Saturday’s trip to Berwick. However the Clyde boss was pleased with how his injury-hit side performed against the table toppers. He said: “I’m disappointed, we set out to win the game. Even Gary Bollan says we were the better team. “I was delighted that performance, commitment and effort were all there. “We had everything – the only thing we had missing was a goal. “We had a lot of chances, we dominated the game there’s no doubt about that. “I’m disappointed because I want to win all games. Forfar have come here and won but probably not played the way they wanted. “There’s a long way to go, and I’ve said that to them in there. We’ve got a few missing players but we’ll soldier on. Defender Martin McNiff will be available again after missing the Forfar match through suspension.